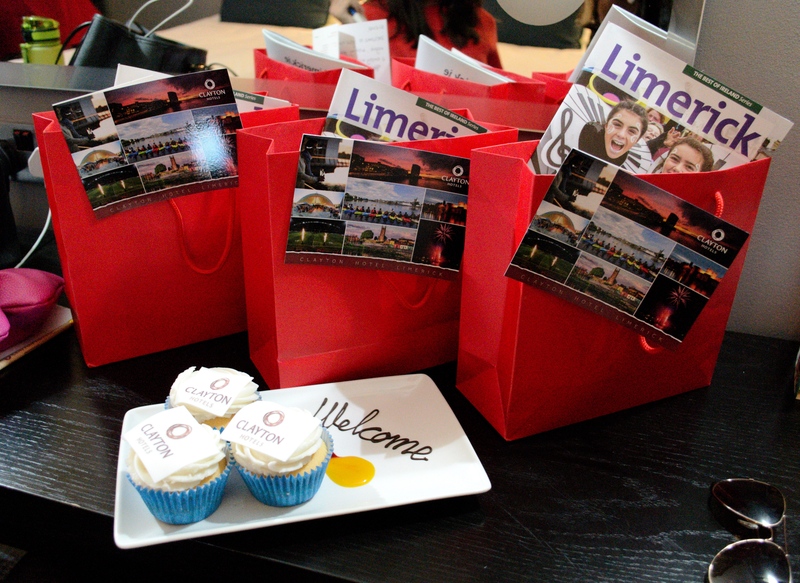 A few weeks ago, the girls and I packed our bags and drove to Limerick for a night away. The Clayton Limerick kindly invited Kassi for her actual hen but we didn’t manage to find a date that that suited everyone before the wedding so we ended up having a post-hen party! 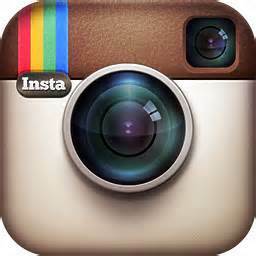 I posted up Snapchat and Instagram Stories throughout the trip but for those of you that might not have seen them! We had the best time! Once we arrived, the staff at the Clayton were very welcoming and they had organised a great night for us. I hadn’t been to the Clayton Hotel in Limerick in about 2 years so it was nice to be back. It’s in a really nice location and it overlooks the river Shannon. As there was five of us we had two rooms. Each room had great views of the river which got better as the sun began to set. The bridges lit up at night are beautiful. 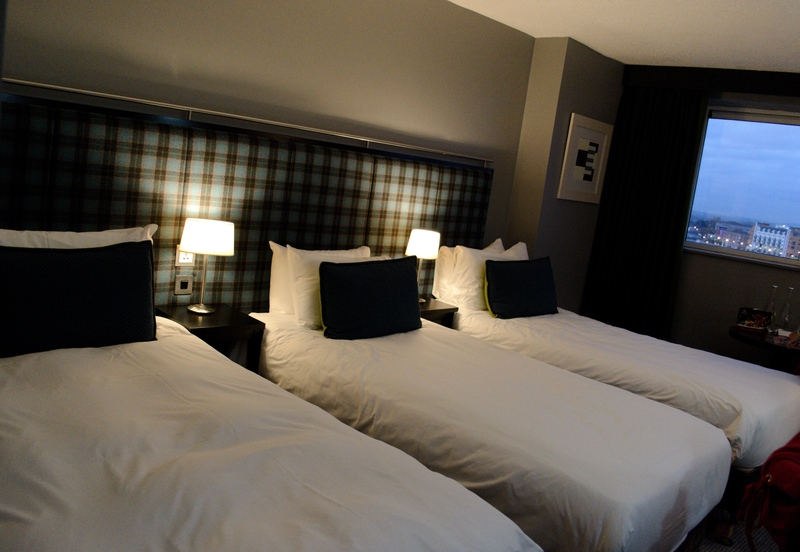 Mei Ling, Nirina and I had a really spacious room and my bed was very comfortable. That night we had dinner reservations at the hotel which was very convenient as we were all quite tired after the drive over. 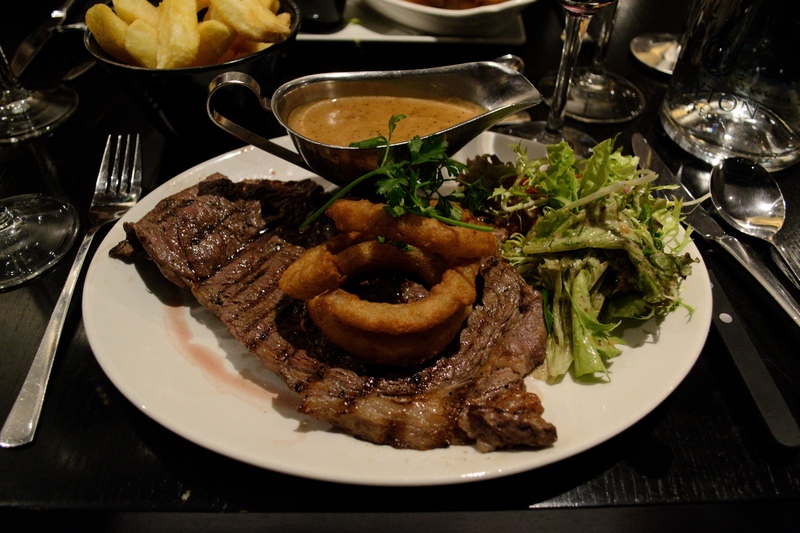 The restaurant had a fantastic selection of food and drinks, there was a cosy atmosphere and the staff were very accommodating. 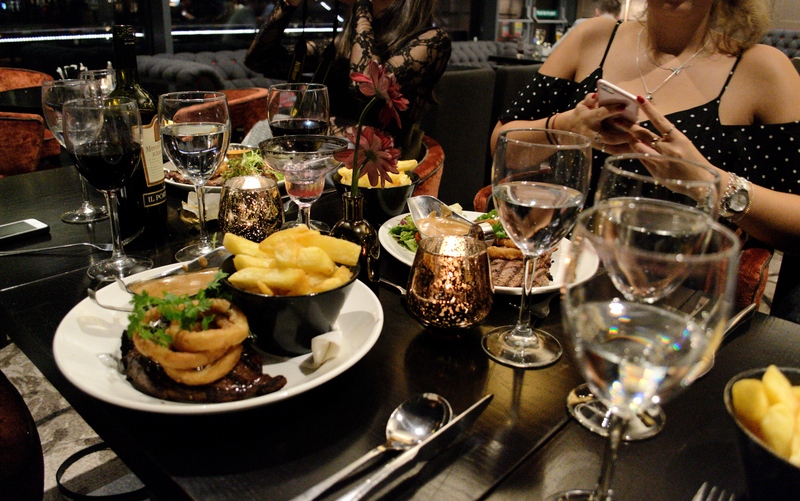 I ordered the steak and a glass of my ‘now favourite’ Italian wine Montepulciano, making it the best combination for a great start of an evening full of catch ups with the girls. We were planning to have a party night at the House in Limerick but we were all so tired by the drive and we couldn’t wait to jump into bed. But first, we all had a little sleep over catching up until all hours in our rooms. The next day we had some much-needed breakfast to get us going for the day. We had lots to see and shoot before heading back to Dublin. The Clayton hotel made this press day one to remember and we got some well-needed rest and relaxation in the process. Such a nice break away, I am really looking forward to heading back to Limerick again as it has so much to offer. We only got to spend one night in Limerick and the best way to discover the city and see all the main sights was by hiring a carriage tour. 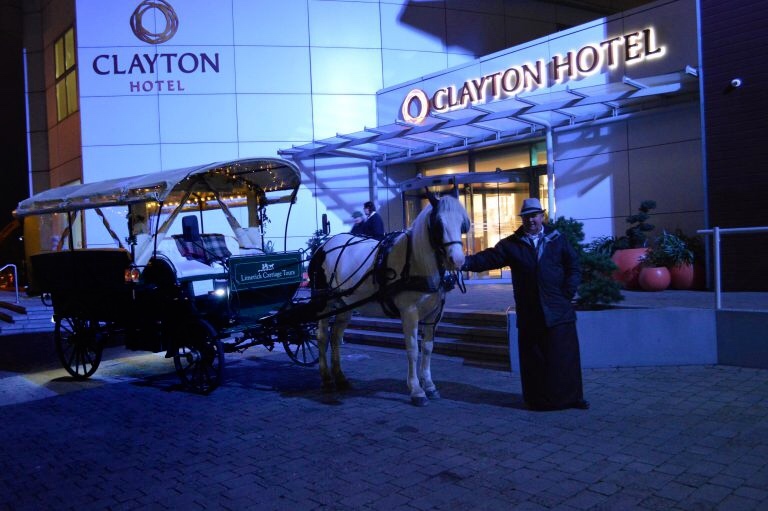 Clayton Limerick hotel had everything organised and we got so excited seeing our carriage waiting for us outside our hotel the evening we arrived. 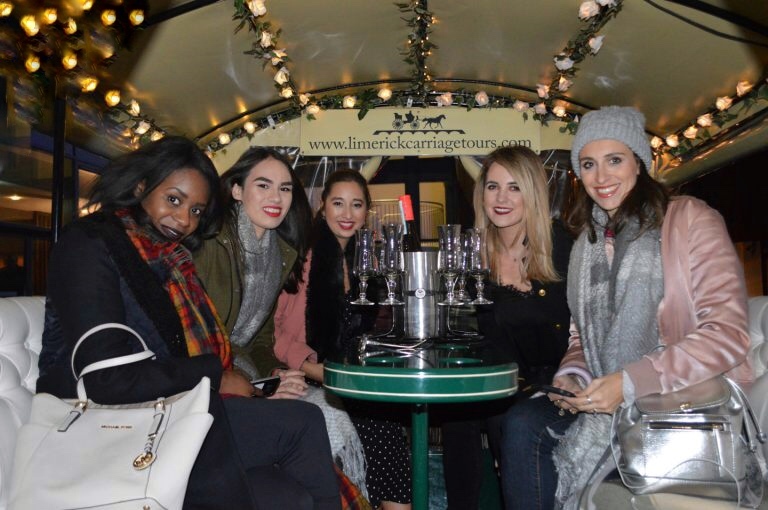 If you are ever in Limerick make sure you book a carriage tour to explore the city while having a glass of bubbly. Our beautiful horse was called Molly and she did an amazing job taking us around the city, we also got a lot of historical information about Limerick and the owners made sure we were kept warm while being covered up in our blankets. If you are a hen party visiting Limerick make sure to check out the offers that Clayton Hotel Limerick has here. I shot this look just before we headed back to Dublin. I’m sure a good few of you know by now how much I love pops of colour. Red isn’t usually a colour I would wear often but I am starting to love it – especially with black! I teamed it up with this high waist skirt and my trusty sock boots. I wear these boots at least twice a week and have done since I got them. Both my jumper and skirt are from Primark, my boots are from Littlewoods Ireland (similar boots) and my bag is from Furla.